Well, I was sitting at work on Friday, and wasn't being too productive since most of the company was out for the day giving themselves an extra-long Memorial Day weekend, and I was just scouring the web reading "Indiana Jones and the Crystal Skull" reviews. As I mentioned a few weeks ago before the Summer movie season started, I am an Indiana Jones FREAK! Raiders of the Lost Ark is without question my favorite movie of all time (narrowly beating out Godfather II), and since I was a kid, I have been obsessed with all things Indiana Jones. It's been NINETEEN damn years since the last movie, so I have been super-stoked for this one. So, while sitting at work, I mentioned to one of my only co-workers who was in the office, how we should just play hooky and go see a morning viewing of Indy 4. Much to my surprise, he took me up on it, so the little devil whispering to me all morning got his way, and we snuck out of the office to see the 10:30 AM showing. Overall, my first reaction to this film is ..... "disappointing". Mind you, I had my warning lights up loooong before going into seeing Indy 4. The film had an almost legendary amount of scripts written for it, each with either Steven Spielberg, George Lucas, or Harrison Ford vetoing it, before the next one got written. Then a few years back, there was talk of an outstanding script that Frank Darabont had written that Spielberg and Ford LOVED, but Lucas vetoed. George Lucas, the man who has forgotten how to make a good movie. The man who subjected us to the last 3 Star Wars fiascos. I have no doubt that the Frank Darabont Script is the one that this movie SHOULD have been. What's worse, the rumor has been that Indy 4's script is mostly just a mish-mash of parts of all the other scripts, and now after seeing it, I can definitely see that parts of the other stories I had heard thrown about were mixed in Crystal Skull. It's not all bad, however. It was truly great to see Karen Allen back as Marion Ravenwood, although I thought that she was overacting a little too much. Shia LaBeouf was pretty solid as Indy's new sidekick. 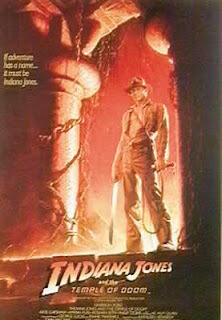 And of course, it was great to see Harrison Ford back as Indiana Jones, although I have to say that this SHOULD be his last Indy movie.... his age really showed through in this film. I think what bothered me most about Indy 4, was the main storyline itself. I won't spoil it for those of you who haven't seen it yet, but I will just say this: Indiana Jones should NOT have gone there. The theme of this movie just does not "suit" Indiana Jones, and it made the final scene almost painful to watch. Before the last 15 minutes, I was going to put this film slightly above "Last Crusade", which I have always said is the weakest of the previous 3 films, but now, I'm not so sure. Another viewing may be in order to solidify my final standings, but I'm pretty sure that when the dust settles, "Crystal Skull" will be my least favorite Indiana Jones movie. Which is a shame.... after waiting 19 years, we deserved better.